Don’t Blame the CFO is about ten classic business mistakes that small and mid-size companies make. These mistakes can prove fatal to a company, and in some cases they were. Are you in a company that is a step away from making a fatal mistake? To help us determine how to protect ourselves and our careers from business troubles, I’ve been joined by Robert Right the author behind ‘Don’t Blame the CFO’. Robert, why did you want to write about these business mistakes in ‘Don’t Blame the CFO’? It started from my personal experience and wanting to warn younger executives thinking about moving from a big company to a small company from making some of the mistakes that I made in choosing the wrong companies or people to work for. Some of these experiences were extremely stressful, and it is unhealthy to have to live through experiences like these when they can be avoided if you know what to look for. Were these experiences all from your own life, or did you also include the experiences of others? All of these experiences happened to me or to my immediate predecessors in my CFO roles. And I’m sure I have some readers who might not believe the people that you feature in the book are real. Can you confirm if they’re real for the sceptical readers among us? Are the real people from these experiences who you had in mind during ‘Don’t Blame the CFO’? In this first book, I was trying to help aspiring CFO’s in business. We’ll touch on your second book and beyond in a minute, but first I want to know a little more about the help you wanted to provide to these aspiring CFOs. What did you want them to know about? I wanted to tell other junior executives the personality types to avoid in their careers. It is so easy to make a choice that seems great at the time but is really a bad choice with serious personal consequences. What was the greatest reward that came from sharing what you’ve learnt from your own bad choices? I had wanted to write this book for years, so it was very fulfilling just to complete it and purge all of these experiences out of me. Really, it was very therapeutic to write this book. I’m glad to hear that you found it therapeutic. What have you learned from this writing therapy? Writing is the easy part. The hard part is getting reviews and promotions. That part is much harder than the writing. Getting that promotion wheel rolling can be incredibly difficult, but you’ve got it rolling now so you just need to keep pushing it as much as possible until it takes off! But whilst it continues to crank up into gear, I’m sure you’re continuing to write. Why do you write? The first time I wanted to write this book to warn others about some of the mistakes that I have made. Now, I am just getting ideas coming to me out of the blue. Can you share a few of those ideas that are in the pipeline? I am working on two books related to current politics and a science fiction book. From business to politics and sci-fi. That’s a decent breadth of ideas, how do you get direction and keep your ideas organised and working for you? For me, the direction unfolds during the writing and creative process. I think that this will really be true in my next books. I really had ideas come to me out of the blue, so I will see how they develop as I start to write them. What does that writing and development process look like for you at the moment? I have a full-time 12 hour a day job, so I really write when I can find the time. Luckily, I wrote my first book pretty quickly between consulting assignments. Now that I am full-time permanently employed again, it will take longer and more willpower to make the time. I am determined. Did the determination stretch to editing for that first book? I did most of the editing myself. I have a very successful author who is a mentor, and he helped me explain complex business topics in a better way that is more understandable to those who don’t work in high finance. Even though you’re early in your writing career, I’m sure you’ve seen development in your writing. Do you feel you have seen great progress in your author journey so far? I think that I am getting more fearless about topics now. Some of my upcoming works will be controversial. As you’re planning to tackle the controversial, have you thought about how you these controversial works will look alongside your other books? No, because I will be using different pen names for most of my books. Okay, so that works around any controversial issues quite nicely. With one published book under your belt, what advice to do you have to other aspiring authors looking to do the same? Find a mentor. Attend writing seminars. There are a lot of good virtual seminars on the web now, but take them to learn marketing, promotion, etc. But write your book your own way. It is a part of you that you are sharing with the world. And you do have to share yourself with the world! Yes. Don’t wait. I waited ten years from the time I had the concept to actually writing the book. Never put off anything creative that comes to you. Care enough about yourself to just get it done. I’m glad to hear that you cared enough about yourself to get ‘Don’t Blame the CFO’ into the world, and I hope that you can continue to find moments in your life to continue to share the creativity in your upcoming books. Excited to read the book we discussed today? Find it here on Amazon: ‘Don’t Blame the CFO ( ASIN: B071V4LPPZ )‘. 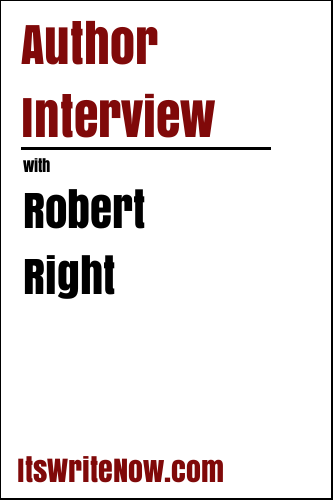 Want to find out more about Robert Right? Connect here!